These cards are better I feel at helping children recognise symbols and most children have experience working with flash cards so are easy to understand. I also felt they're helpful when showing the letters to more than one child so all can see and participate as a group. Brought the cards to introduce Arabic to my toddler. However, I think they really good as will teach me a little animal names in Arabic too. 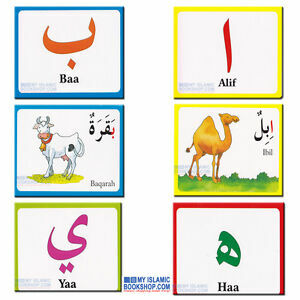 Seem good quality n similar to elc alphabet flash cards in quality. One character seems to be missing the jeem. Otherwise great quality and keeps kids entertained. It's lovely I like it.